The Bucyrus Elementary School will host the annual Scholastic Book Fair Monday, Nov. 5, through Friday, Nov. 9. The Book Fair, which will take place in the Elementary School Media Center, will be open to students from 8:15-10:30 a.m. and 12:30-3:00 p.m. during the school day. The community is invited to attend a special Family and Community Book Shopping Night Thursday, Nov. 8 from 5:00-7:00 p.m.
“The Book Fair is a great way to connect your children with books they want to read, plus they make great gifts,” Bucyrus Elementary Librarian Diane Kaple said. 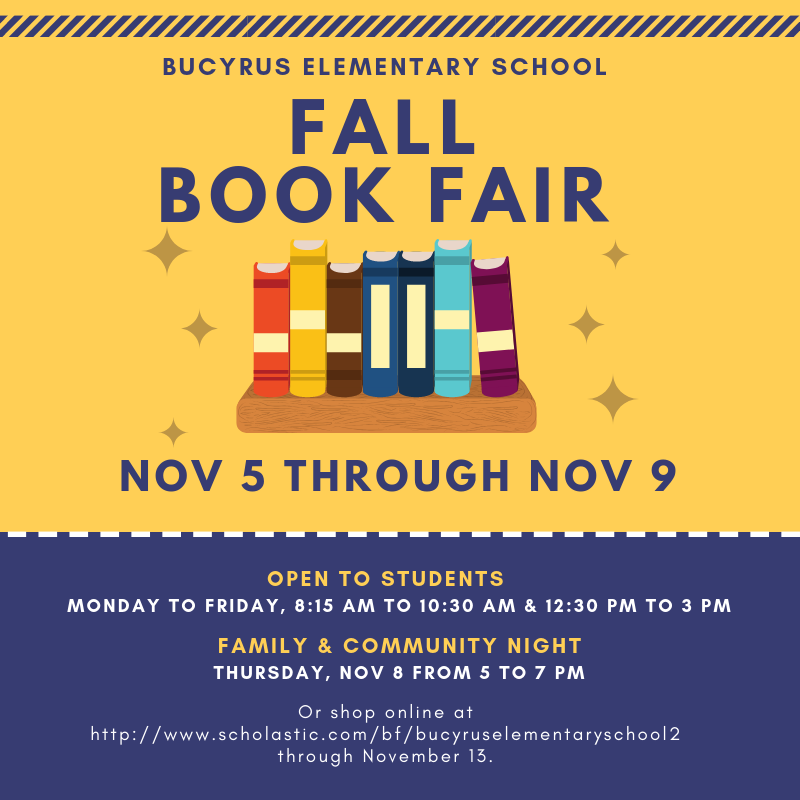 If you are unable to attend the Fair in person, please visit the online Book Fair at http://www.scholastic.com/bf/bucyruselementaryschool2. Payments can be made using cash, check or credit card. Checks should be made payable to BES PTO. Money raised will go toward purchasing new books for teachers’ classrooms, as well as the school library. Thank you for encouraging your child to read. We appreciate your support and look forward to seeing you at the Book Fair. If you have questions, you can contact Diane Kaple at the Elementary School at (419) 562-6089 or dkaple@bucyrusschools.org.